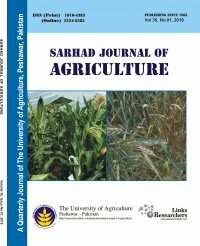 Sarhad Journal of Agriculture (Print ISSN 1016-4383; Online ISSN 2224-5383) is the official journal of The University of Agriculture, Peshawar, Pakistan. It was founded and established by Dr. Naseer Hussain in 1985 and has taken roles as inaugural Editor of the journal. SJA has been publishing regularly since 1985 and is fully online since 2006. 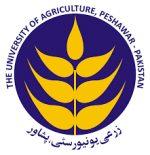 In 2014, SJA decided to join the Smith and Franklin publishers for its content management and publications, while still independently regulated under the banner of The University of Agriculture, Peshawar, Pakistan. SJA is an open-access and peer-reviewed journal that publishes research articles on quarterly basis in every discipline of agriculture including Plant Production Sciences, Protection Sciences, Nutrition Sciences and Social Sciences. The research articles are received from national and international agricultural scientists, which are referred to highly qualified, capable and experienced subject specialists for evaluation. The journal is managed by highly qualified Editorial Board under the supervision of Chief Editor and Patron (Vice Chancellor). More than forty organizations including foreign missions in Pakistan and some foreign countries including India, Kenya, Japan, UK and USA receive the journal regularly on exchange basis. It is also subscribed by various national and international organizations including Netherlands, UK, Germany and some Agricultural Research Stations/Institutes in the province. CAB International of UK is the permanent subscriber of SJA, which disseminates its abstracts. Sarhad Journal of Agriculture is an open access and peer-reviewed journal which publishes most recent and informative research and reviews in all areas of agricultural sciences. The aim of the journal is to provide a platform for scientists, students and researchers to promote and share new trends and developments in different areas of agricultural sciences. The journal is fully committed to provide free access to all articles as soon as they are published. All correspondence should be addressed to the Chief Editor, Sarhad Journal of Agriculture, The University of Agriculture, Peshawar, 25130, Pakistan. The journal is partially supported by The Higher Education Commission of Pakistan and is one of the few HEC-recognized journals in the country.